There are many versions, build numbers, editions or revisions such as Beta, Release Candidate (RC), Release to Manufacturing (RTM) or even retail copies of Windows Vista and/or Windows Server 2008. Actually the comment is true for any Windows Operating System. 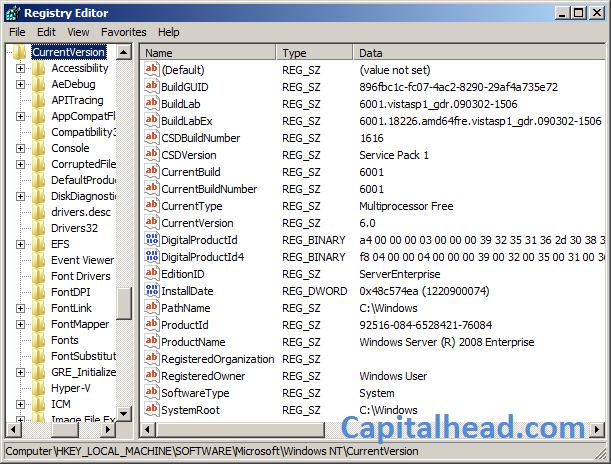 So how do find out the revision number of your Windows Vista or Windows Server 2008 – this article will help you find out. There are many different versions of the same Windows Vista or Server 2008 software because as with most software products, achieving the perfect final build is an iterative process. Most start out with a Beta, which after a period of testing will progress into a Release Candidate (RC) and after further testing may reach Escrow (Final Testing) and finally Release to Manufacturing (RTM) status. Sometimes people inadvertently install the incorrect version, or an old release. Installing the incorrect version may restrict your ability to upgrade to future releases or may even stop functioning after a period of time, also called Time Crippled Release. Therefore it’s important to know exactly what version is installed. As with all software project it is important to understand that versioning is an important part of the solution. Tracking version numbers allows us to identify problems in specific components or pinpoints certain pieces of software where things were working as expected. 6.0.6001.16497 where the parts are separated by a full stop. The easiest way is to use built in tools which help you perform this task. Within easy reach you have two options, Systeminfo or Ver. Ver is the quickest to use. To use any of these tools you will need to start the command prompt. At the command prompt type ver and press Enter. System Information (SystemInfo) also gives this information, however it returns much more than is needed for this small task. To run systeminfo, at the command prompt execute systeminfo and hit Enter. As you can see you get more information using the systeminfo command, such as the machine name, System model as well as the Revision and Build number. In addition SystemInfo also lists the Service Pack level. Although for most purposes the Ver or SystemInfo command will do what we want, they lack the ability to show the revision number. This may be an important piece of information when trying to figure out whether the Windows version of RC or RTM. The reason for this is that usually there aren’t many changes between these two versions and sometimes only the revision number is affected from one version to the next. Open Registry Editor by typing Regedit at the command prompt, then hit Enter. In the right pane, you will see many registry keys and their values. The following summary will give you Here’s how you read the value for some of the keys. The product name of Windows Vista or Windows Server 2008 edition on the system. For example, Windows Server (R) 2008 Enterprise. The edition of the operating system. For example, ServerEnterprise. Contains the build and revision number. For example, 6001.18226.amd64fre.vistasp1_gdr.090302-1506 where the first portion gives you the build number (6001) and the next set is the revision number (18226). This article has demonstrated three methods of finding out the Major, Minor, Build and Revision version of Windows Vista and Windows Server 2008. The first method used the Ver command, the second the SystemInfo command, and the third and advanced method used the Registry Editor (RegEdit).